The world of blogging and social media is changing rapidly every day. Sometimes it can be difficult to keep up with it all. 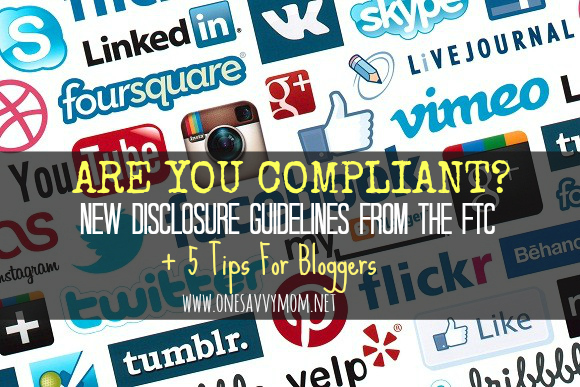 For bloggers that partner with brands, there are new disclosure guidelines set forth by the FTC. What do these changes mean for you, as a blogger? It may require a few simple updates to the way that you present reviews and sponsored content on your blog/ website and other social media networking platforms. If your a Blogger or if you work in Social Media Marketing, you should definitely check out the new guide. 1. Blog Posts: Proper disclosures should be included in all blog posts and placed before a link or hyperlink. This means placing your written disclosure (not a link to a disclosure page) before relevant brand links, in your blog posts. 2. Properly Label Hyperlinks: Readers should be able to tell what they are clicking on by the word attached to the hyperlink. 4. Video/Audio: Audio clips should indicate sponsorship verbally. Video clips should include verbal and/or obvious visual cues indicating sponsorship.